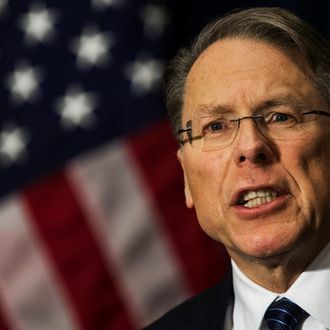 NRA executive vice president Wayne LaPierre has been laying low since his poorly received appearance on Meet the Press last month, but on Tuesday night, he reemerged with what the organization called a “major response” to President Obama’s inaugural address on Monday. The president actually only made one specific reference to gun violence, saying America’s children, including those in “the quiet lanes of Newtown,” must know that they’re “cared for and cherished and always safe from harm.” LaPierre didn’t address that point, and instead the 12-minute speech at a hunting conference in Nevada fixated on Obama’s remark that we shouldn’t “mistake absolutism for principle, or substitute spectacle for politics, or treat name-calling as reasoned debate,” which was widely interpreted as a reference to congressional Republicans. So if anyone was wondering if the NRA is listening to the many people who say their current tactics are too extreme and counterproductive, the answer is clearly no.